Democratic VP nominee Sen. Biden says "Joe" would "do very well under us"
Sen. McCain used Wurzelbacher to attack Obama's plan to "spread the wealth"
(CNN) -- A week ago he was a little-known plumber quietly practicing his trade in northwestern Ohio. Now Joe Wurzelbacher is a talking point in the race for the White House. 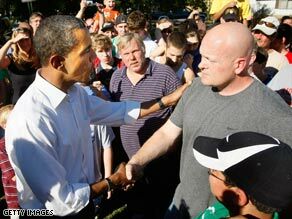 Barack Obama, left, shakes hands with Joe "the Plumber" Wurzelbacher at a Sunday campaign event. Wurzelbacher, now dubbed "Joe the Plumber," heard his name invoked in whole or in part more than two dozen times during Wednesday's presidential debate in Hempstead, New York, first by Sen. John McCain and then by Sen. Barack Obama. "I was just really surprised that my name was mentioned," he told reporters after the debate. "I think it helped them get their points across, so I was happy about that." Wurzelbacher works for Newell Plumbing & Heating Co., a small firm in the Toledo area, The Toledo Blade reported. Local election officials confirmed that Wurzelbacher was registered to vote. They said that he was incorrectly registered as Samuel Joseph Worzelbacher and that he voted for the first time in Pennsylvania's Republican primary on March 4. The officials said Wurzelbacher's name was misspelled in the voter registration database. Wurzelbacher is keeping who he plans to vote for to himself but says he leans conservative. In his exchange with Obama, Wurzelbacher asked if the presidential candidate believed in the American Dream. Wurzelbacher said he was about to buy the plumbing company that he works for and was concerned that Obama would tax him more because of it. Obama explained his tax plan in depth to Wurzelbacher, saying it's better to lower taxes for Americans who make less money so they can afford to patronize his business. "I think that when you spread the wealth around, it's good for everybody," Obama told Wurzelbacher. "We're going to take Joe's money, give it to Sen. Obama, and let him spread the wealth around. I want Joe the plumber to spread the wealth around," McCain said. Obama countered that both he and McCain want to cut taxes, but that his plan would cut taxes for "95 percent of American families," more than McCain's plan. Thursday morning, Obama's running mate, Sen. Joe Biden, said plumbers would not be affected by the Democrat's tax policies. "You notice John [McCain] continues to cling to the notion of this guy Joe the Plumber," Biden said on NBC's "Today" show. "I don't have any Joe the plumbers in my neighborhood that make $250,000 a year that are worried." According to the Bureau of Labor Statistics, the mean annual wage for plumbers, pipefitters and steamfitters in the United States in 2007 was $47,350. Wurzelbacher is the second "Joe" invoked by the McCain campaign, which is attempting to appeal to so-called average Americans. Republican vice presidential candidate Sarah Palin referred to "Joe Six-Pack American" in a radio interview this month in which she touted the folksiness that's been central to her political success in Alaska. "I think they're just not used to someone coming in from the outside saying, 'You know what? It's time that normal Joe Six-Pack American is finally represented in the position of vice presidency,' and I think that that's kind of taken some people off-guard," she told conservative radio host Hugh Hewitt. CNN's Mary Snow contributed to this report.